Stitches West meet and greet! Come see us at the Purlescence booth, Saturday, February 28th from 2-4 PM. And, swag! Gigi is making good progress on her On the Vine scarf. Jasmin is trying to do 2 rows every night on her Ene's Scarf. Jasmin has finished her Bird of Paradise socks. She has also finished her black cashmere Jacoby mitts. She's thinking about knitting some argyle wristers. Gigi is nearly done with the Bulky Boot Socks, and has been making steady progress on her Scandinavian socks. She is also nearly done with the Rowan Ribbon Twist sweater. Jasmin is making steady progress on her Modern Quilt Wrap. Jasmin has been spinning! She has finished spinning the singles of the Black Magic Woman, and it is resting on the bobbins waiting to be plied. 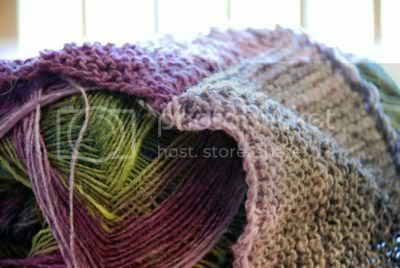 Jasmin and Gigi wax poetic about knitting with the Wild Plum colorway of the Lamb's Pride Worsted. Jasmin wants to knit a Twist cardigan out of it. Chloe went to Unwind in Burbank and picked up Jasmin's PERFECT color of green (Apple Green) in Malabrigo. Jasmin and Gigi offer suggestions on how to manage your budget at Stitches. 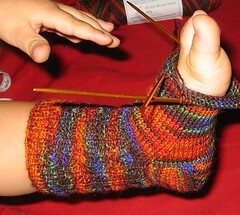 - Shoes to wear handknit socks with. - If they're a fan of the remote control, get an all-in-one remote (we like that one). Sock gnomes have made off with Gigi's sock yarn. Jasmin loses a filling to caramel, and is considering knitting some cashmere Jacoby mitts for her dentist, who came in on a Sunday to fix her tooth. Jasmin and Gigi review Crystal Palace Mini Mochi (we're using color 101), and Hiya Hiya bamboo circular needles. We compare Mini Mochi to Noro Kureyon Sock, and copare the Hiya Hiya bamboo circs to Crystal Palace bamboo circs, KA bamboo circs, and Clover bamboo circs. I just reached the heel of my socks using Noro Kuryeon and sure enough, the yarn is so thin I think I'll have to frog the whole pair of socks. Maybe I'll just make a scarf!!! 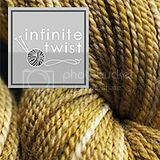 I'm really excited about the mini mochi sock yarn for simple weaving-- I have been planning on buying kureyon sock/kauni for that purpose but have always held off since I find both pretty... unbearable as far as next to neck wear goes. Mini mochi sounds awesome though. I think a sock-off between yall is hilarious :) Another idea for color progression on the heel would be an afterthought/peasant heel; that way you could probably choose the color of the heel from the leftovers and still be able to micromanage stripes on each sock if you wanted. I do find at heels not deep enough for my liking tho. There was a discussion on Ravelry several months ago about how to pronounce Ene. I think someone said that it's pronounced like Anna, but with an Eh sound rather than the A (Ehnneh). I just like to call it "That Nancy Bush Scarf/Shawl Thing in Scarf Style."